Eating to win: What should your game day diet be? When it comes to game day meal preparation, what should an athlete eat? Pregame dietary routine is an important contributor for top performance. Pasta parties are a popular team bonding event for high school athletics, and many continue the practice later in life. Pregame meals seldom differ for these amateur athletes. Different styles of pasta make up most of the spread while the green salad is hardly touched. 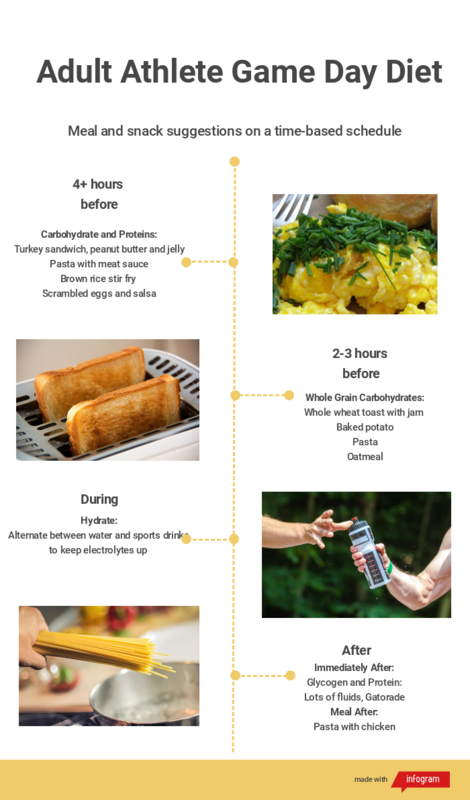 Carbo-loading is a traditional practice for athletes, but there is much more to eating for success than just pasta. The tradition of carbo-loading through pasta — increasing the amount of carbs in order to store more fuel in the muscles — is followed by athletes, yet many do not understand the benefits or the risks associated with it. An excess of carbohydrates can lead to a drop in blood sugar levels, contributing to shakiness, decreased energy and foggy thinking. Research shows an athlete, when planning game day meals, should consider certain factors such as age, activity levels and daily diet. Breaking a meal plan down into an hourly or a meal-based schedule based on the speed at which the food digests will avoid an upset stomach and maximize the absorption of nutrients. It is important to focus on all five food groups (proteins, grains, vegetables, fruit and dairy), while keeping a proper balance. Carbohydrates remain in this diet, but it is important to get them from a variety of foods beyond pastas. Even for youth athletes, monitoring meals on game day is important. 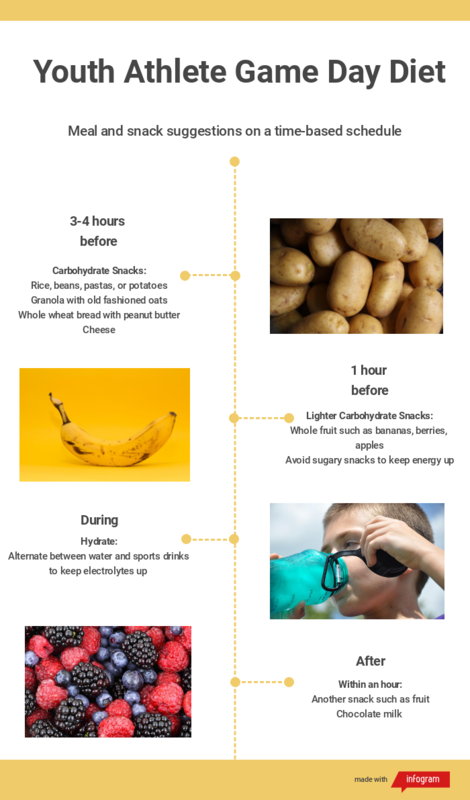 Avoiding overly fatty foods or processed sugar applies to all, but many overlook youth athletes diets as they may not be competing to a “professional caliber”. Among the professional ranks, NBA players have found different foods that lead to success. Boston Celtics strength and conditioning coach Bryan Doo unknowingly started a pre-game addiction throughout the league: PB&J sandwiches. Utilizing an alternate source of carbohydrates, these professional athletes found the key to a great game in a traditional children’s food. An absence of balance in a diet not only leads to poor performance, but also can lead to injuries that are otherwise avoidable. Studies find that a lack of vitamin D in a diet contributes to repeat injuries, and many stress fractures are attributed to low calcium intake. 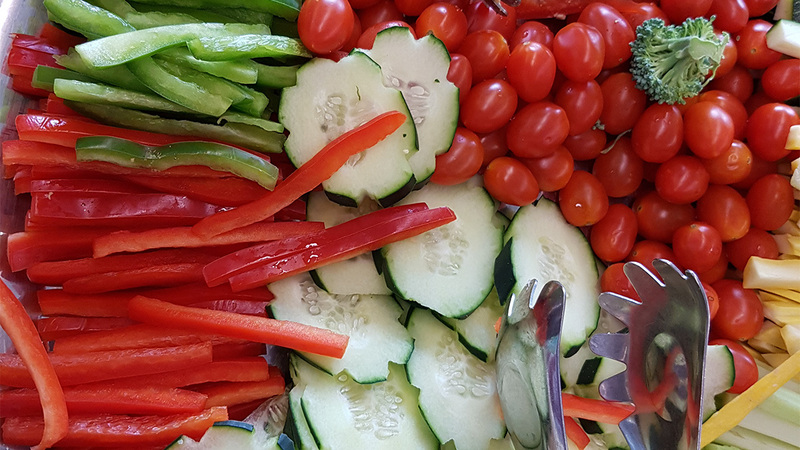 While game day prep is an important aspect for success in competition, waiting until the pregame meal to consume vital nutrients or fulfill dietary needs does not work. Including these meals within a balanced diet will have the most effective results.